In a significant shift in consumer focus and consumption habits, “diets” have been replaced by following a specific eating pattern instead, and losing weight is no longer the primary goal. (No doubt to the chagrin of many weight loss businesses.) Instead, more consumers are eating to optimize mental and physical performance, energy levels, and health. Elimination is a pillar of a number of these selective eating patterns, such as gluten-free and dairy-free. It’s becoming normal for consumers to experiment with new ways of eating for periods throughout the year. As Hartman cites in its US research, “changing diets isn’t just a New Year’s Resolution: nearly half of consumers do it year-round.” And, of course, millennials lead the way with 59% having tried a new eating approach within the past year, as compared to 44% of the general population. For example, intermittent fasting is edging into the mainstream thanks to the keto diet. According to the IFIC Annual Food and Health Survey, it’s the top eating pattern with an estimated 10% of Americans doing so. And, carbs have again become the villain. Some of you no doubt remember the Atkins Diet that morphed into South Beach and, arguably, most recently Keto. Why is the concept of “dieting” in the traditional sense dying off? It's partly due to the increasing popularity of the size-acceptance movement, as well as dieting fatigue and the growing understanding that most diets don’t work. It’s no coincidence that Weight Watchers rebranded as “WW - Wellness that Works”, shifting to wellness rather than weight as its primary focus. This massive rebranding effort, with an assist from Oprah, has fallen flat based on recent disappointing financial results. One in three people report following a specific diet or eating pattern, double that of a year ago. (Source: IFIC Annual Survey) The rise of online shopping and influencer communities with shared values and shared pain points like food sensitivities has fuelled trends including keto and paleo. Those eating patterns that today appear to be niche could be tomorrow’s gluten-free market. The rise of smartphones and artificial intelligence (AI) is resulting in new apps like Pinto and Calorie Mama to help support selective eaters. With Calorie Mama, you take a picture of your meal and upload it to the app, which uses AI to analyze the food’s nutritional qualities and assess how well that meal fulfills the user’s specific dietary plan. The user can specify what selective diet they want (examples include paleo, ketogenic, or vegan diet), or they can ask the app to flag foods that contain allergens or ingredients that would trigger food intolerances. This represents opportunities for companies that can offer seemingly personalized options while appealing to a broad enough market. For an idea of how it works, watch this brief video. Kroger debuted the OptUp app, a personalized wellness resource, in November. It scores your food choices based on a nationally recognized nutrient profiling system that has been enhanced by their own internal team of registered dietitians. It rates all products it carries, and then based on shopper history recommends healthier products for you. You can watch the video here. Consumers are moving beyond the traditional food pyramid and plate of meat, veggies, and carbs to food tribes that represent values and lifestyles. 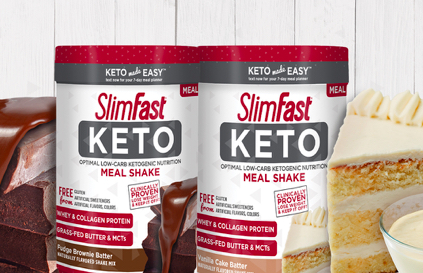 The launch of Slimfast Keto on January 1st shows a mainstreaming of the keto trend. And on January 4th Kraft Heinz completed its purchase of better-for-you, keto-inspired, condiment and sauce brand Primal Kitchen for $200 million. QSR Chipotle launched lifestyle-specific bowls in January as part of their mission to become more accessible and culturally relevant to consumers. The inspiration came from watching consumers create their own bowls to meet their selective eating needs. How can your business respond to this shift to selective eating? Selective Eating isn’t a fad. What food tribes should you be reaching out to? Can you make your label clearer to allow for easier shopping by these food tribes? Can you make family dinner time more flexible by offering additions on the side for customization options? Can you use E-commerce to provide more personalization options than are available in the physical store? Can you use your customer loyalty database to curate products that fit their selective eating choices? Can you meet these shoppers’ needs without them feeling like they had to pay a huge premium on their grocery bill? Can you introduce more flexibility into your menu to allow for more customization? Can you highlight items on your menu that meet specific diets such as vegan or keto? Can you make your guests feel loved rather than socially snubbed by having waitstaff who understand how your offerings meet their needs? To read our complete review of the trends changing the landscape of the food and beverage industry, download your free copy of the 2019 Nourish Trend Report today.